The new LED Studio-in-a-Box from Fotodiox comes in a choice of four sizes, and offers a simple tabletop solution for basic product photography and macro / still life work. Fotodiox has announced a new LED Studio-in-a-Box, designed to make it easy to create simple macro and product images on a tabletop. Aimed at Etsy and Ebay sellers just as much as macro and still life enthusiasts, the Studio-in-a-box comes in four sizes, from 16×16″ ($69.99) all the way up to 28″x28″ ($119.99). Each model comes with an integrated ring of LED lights, and four plastic, wrinkle-free ‘cyclorama’ backdrops. Fotodiox Pro, creator and distributor of several lines of specialty solutions for videography, cinematography and photography, has announced the LED Studio-in-a-Box: a lightweight, fold-out kit that provides tabletop photographers with a fully-contained environment for shooting clean, professional images. Ideal for small business owners, artists, retailers and independent Etsy and eBay sellers, the LED Studio-in-a-Box comes equipped with built-in LED lights and a removable diffusion panel for maximum control and ease of use. Available in four different sizes, the LED Studio-in-a-Box can be purchased now on FotodioxPro.com. 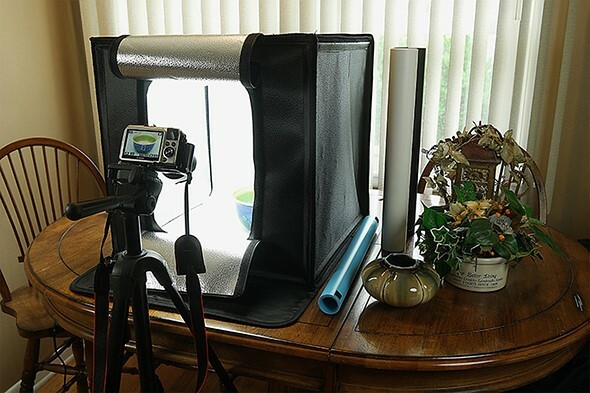 The LED Studio-in-a-Box can be set up by photographers of any skill level in well under five minutes, with no need for tools, and folds down flat after use. The kit includes four plastic, wrinkle-free “cyclorama” backgrounds in black, white, gray and blue, as well as a removable diffusion panel and an integrated ring of top-mounted LED lights for a powerful, even glow. Perfect for macro photographers, professional tabletop photographers and artisans, the LED Studio-in-a-Box saves an enormous amount of time and space, and allows any user to shoot dynamic, expertly lit images with any type of camera, including smartphones. To learn more about the Studio-in-a-Box and Fotodiox Pro’s additional photography and filmmaking accessories, please visit FotodioxPro.com. View unboxing videos and product demonstrations via youtube.com/user/FotodioxInc. Serving the photo and video markets since 2004, Fotodiox Pro is a leading manufacturer and distributor of high-quality, professional and affordable photography and filmmaking accessories. Known for such products as the WonderPana wide-angle filter system, the Vizelex ND Throttle adapter series, the ever-expanding line of award-winning GoTough accessories for GoPro cameras, and the groundbreaking FlapJack LED Edgelights, Fotodiox Pro is also responsible for bringing the CamDolly Cinema System – the industry’s first truly portable, modular dolly system for professional videography gear – to filmmakers in the United States. For more information about Fotodiox Pro, please explore online at http://www.fotodioxpro.com, http://www.youtube.com/user/FotodioxInc, http://www.facebook.com/Fotodiox and http://www.twitter.com/Fotodiox.